Lewis Hamilton (1st, 1:27.319): "I've been coming here for so long, but it's my first pole here at Suzuka! It was definitely worth the wait. I didn't make one mistake all session and just kept getting better and better. We built the foundation in Q1 and then just built upon it as qualifying developed. I've been waiting all weekend for that moment, for that lap in Q3 - and it feels so good when that comes together. It's incredible to come here with this car and drive on this track. It's always been one of the greatest but with this car, it's mind-blowing, I wish everyone could feel what we feel. It's always been a crazy rollercoaster ride, but with the downforce on these cars, it's insane. The way you can throw the car around, I love that. We know how quick the Ferraris were in Malaysia, so it'll be interesting to see how we compare. We've put ourselves in the right position to get the job done on Sunday. I don't know if people watching realise how much effort goes into qualifying, but the team worked perfectly to get me out at the right time, into space on track and allow me to do what I needed to do - I'm so grateful for that. They did a great job, I hope I can capitalise on that tomorrow." Valtteri Bottas (2nd, 1:27.651): "It was a tricky day. I had a bit of an off in FP3 and the car was damaged. But the guys did a great job getting the car back together, everything worked perfectly. It's been a few tough races, I've been off the pace quite a lot. So now I'm at least a bit closer and with the limited running we had today, it really wasn't too bad. But it's a shame to lose the position due to a grid penalty. The car has been feeling really different this weekend compared to last week. I was able to trust it more and drive a bit more naturally which always makes the result better. I should never lose self-confidence; it's the key in this sport. I just need to carry on, keep chipping away and learning from everything. I'm going to start on the Soft tyre, so I think we have a chance to try a different strategy to all the other cars around. So hopefully we can gain a few places as overtaking is very difficult on this track." James Allison, Technical Director: "We had a good feeling with the car yesterday, although the sessions were somewhat disturbed by the weather conditions, and that was truly underlined this afternoon with extremely solid performances from both cars in qualifying. One of the nice things about motor racing is the way that it offers a chance of redemption at every Grand Prix. After the difficulties we encountered in Sepang, we have come here and demonstrated in the most eloquent way possible that we mean business here in Suzuka. We know that we have to do it all again tomorrow, but this gives us the best possible starting point for that challenge." Toto Wolff: "The car has been performing well all day - the combination of track surface, layout and temperatures is suiting us much better than a week ago in Sepang. The swings of performance we have seen this season prove that this is a complicated science for each of the teams, and that small factors make a big difference to the final result. Today's result brings us another piece of the puzzle to help our understanding. As for the performance this afternoon, Lewis was untouchable today; he just built up the performance level lap by lap and improved with every run. It was a day that shows why he is one of the best of all time. On the other side of the garage, Valtteri did everything he needed to. He will start on the Soft tyre, which will open up alternative strategies for him tomorrow, and delivered a very strong performance in Q3, finding time on each lap. Overall, a great starting point for tomorrow's race. But the hard work is still to be done." Daniel Ricciardo (4th, 1:28.306): "Once again it was pretty close between myself and Max today. I got the half a tenth on Max this time and he'd had it on me in Qualifying in the last few races. It was pretty important to be ahead and I will start third now because of Bottas' penalty which puts me on the cleaner side of the grid, so thank you Valtteri. I will take everything I can for now and I'm happy with that result. I had a slightly different set-up from Max today and chose to remove some downforce which I hope will help me in the race. I haven't seen Lewis' lap yet but I've seen his time and we can't quite do that, I think we feel we got pretty much everything out of the car today and we definitely couldn't find a second. We will see what tomorrow brings but I think if we can stay in a podium position we will be leaving here pretty happy. The start will be really important for us, it's a pretty tricky track to overtake on and strategy is likely to play in to it but if I can get them on the start then hopefully that will be where I stay. I hope I get my first Suzuka podium, it's always been a fun track but I've never stood on the podium so that's my target." Max Verstappen (5th, 1:28.332): "It wasn't an ideal Qualifying session for me, Q1 and Q2 went well but then we tried a few changes for Q3 which put me out of my rhythm a bit. The time was still ok but I think I could have got a bit more out of it at the end. It was a better second timed lap but I think I could have finished a position higher, it was very tight. The new cars mean higher corner speed which at this track essentially means some corners turn into longer straights, it's a bit more physical and obviously means faster lap times. This also means it is a tougher track for us than in the years before. I think the Mercedes race pace is quick but we are unsure of how Ferrari are looking, tomorrow will tell. We gain one spot with Bottas' penalty so all we can do is fight and try to progress from P4. I would like rain but that isn't going to happen so hopefully with the dry weather we have good degradation and can challenge for a good result. Daniel and I are running different configurations tomorrow so we will have to see how they play come the race. I hope the people in front make Turn 1 interesting tomorrow but not for me. I like sandwiches but not on the track." Christian Horner, Sporting Director: "A pretty straightforward Qualifying for our guys today. Daniel and Max delivered two very clean laps, trying slightly different set-ups going into the race. With the penalties for Bottas and Raikkonen this results in them lining up in third and fourth on the grid for tomorrow's grand prix. This circuit presents challenges to our car comparative to some of our competitors, particularly in Qualifying but we will take some confidence going into tomorrow's race that we can be competitive." Esteban Ocon (7th, 1:29.111): "I'm feeling very happy after qualifying. The car has been fantastic since the beginning of the weekend, just as it was in Malaysia, and our result today shows the progress we have made recently developing the car. Whether it's been wet or dry, the car has been quick, and we've only had to make small adjustments to find the performance. With some penalties for other drivers, it looks as though I will start the race from fifth place, so there's a great opportunity to score some big points." Sergio Perez (8th, 1:29.260): "It's been a really good qualifying session for us. The team did a great job despite the limited running, splitting the practice programme between both cars to find the best set-up. I believe we maximised the potential of the car and got the best result we could today, so I am happy. My final lap in Q3 was good: I lost a little bit of time in the final chicane and that cost me a place to Esteban. He's done a really good job all weekend and together we have delivered an important qualifying result for the team. We were expecting a bigger fight in the midfield, but I am pleased we were this far ahead of our rivals and close to the Red Bulls. Tomorrow will be a long race but I think we can score a lot of points because our race pace is good." Robert Fernley, Deputy Team Principal: "A very strong qualifying session with both drivers delivering on the promise we showed during practice. The car has been competitive all weekend and it's further validation of the excellent work we have done lately to keep pushing the development of the VJM10. With a couple of grid penalties for the cars ahead of us, we should move up on the grid with both cars and it means we are very well placed to score well tomorrow." Felipe Massa (9th, 1:29.480): "I'm so happy with my qualifying. Q1 was a good lap, Q2 was a great lap, and Q3 was just a perfect lap, so I'm really happy with my result. We're starting in a great position and you never know what can happen tomorrow in the race. We'll try to get the best we can in terms of points. My lap time today was similar to when I was on pole in 2006, just the perfect lap, which gives you a lot of pleasure, so I'm happy with that." Lance Stroll (18th, 1:31.409): "That was not a good session. I didn't get a lap time as I was blocked on both my push laps, by Perez and Gasly in the last chicane, and then we got the red flag, so I never got a time and there was no chance to make Q2. But that is how it goes and there is nothing I can do about it now, we were just unlucky with the traffic. The car felt good all weekend, so it is frustrating, but tomorrow is another day and with the penalties we will make up a couple of places. But that is not how we want to gain places, we want to show the potential of the car which we didn't do in that session." Paddy Lowe, Chief Technical Officer: "There was one good story, and one not so good story today, unfortunately. It was a great job by Felipe, he drove some terrific laps throughout the three sessions to put the car in P9. We weren't as quick as any of the cars ahead, so we couldn't have expected anything better than that, so well done to him. On Lance's side, the real damage was done by the red flag which prevented him from doing a second run, where I'm sure he could have showed much stronger pace than he did on his first set of tyres. It's the third session this weekend both cars have been foiled at the start of their fast laps by red flags, so it's just one of those things. With the various grid adjustments, we will end up further forward for tomorrow. Even from Lance's starting position, points are possible, so we will see what we can do with both drivers." Fernando Alonso (10th, 1:30.687): "Knowing that we'd be starting last after changing the engine last night, meant qualifying wasn't too important for us. Still, despite the penalty, we wanted to have a normal qualifying session and push; we have so many fans here - so many Honda supporters - and I think we succeeded and did a decent job. Of course, the race will be much different, starting form the back it'll be quite difficult to gain any advantage, but we'll try to do the best we can to close up to the top 10. Points would have been a difficult target even on a normal weekend, but since we're starting last, on a track with so many high-speed corners where you can't easily follow the cars in front, we'll need a lot of action in front of us if we want to make up some positions." Stoffel Vandoorne (11th, 1:29.778): "That was actually a pretty good session for me. Not getting through into Q3 isn't actually that bad because it means I can start the race on a new tyre tomorrow. Starting from eight/ninth is pretty decent, and, on a new tyre, it should make for a good day. The limited running we've had so far this weekend has been the same for everyone, but we're usually pretty strong at working out what the tyres are going to do, how long they're going to last, and how to manage them efficiently. We'll definitely be looking to benefit from that tomorrow. It still looks quite hard to decide between a one- and two-stop strategy, so we'll also try to use that to our advantage. We're not in a bad place - we can definitely race from this position." Eric Boullier, Racing Director: "Once again, it's encouraging to see both drivers fighting for position on the fringes of the top 10 - it shows the progress we've made this year to be in the thick of it. It's also gratifying to see how closely matched our drivers are - Fernando and Stoffel were split by just 0.029s at the end of Q2, so it's pretty evident that neither is leaving much out there on track. By lining up ninth, but with the benefit of choosing his starting tyre for the race, Stoffel is perfectly placed for an advantageous strategy tomorrow. He's driven extremely well all weekend, and this is a solid underlining of his pace. With a 35-place grid penalty, Fernando was always limited by what he could ultimately achieve in qualifying. But 10th position was a nice reward for us all. 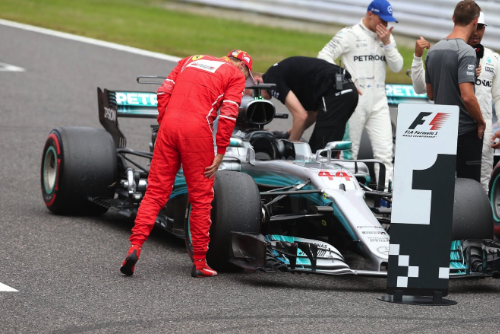 He'll be starting at the back tomorrow, but he's famously done that before at Suzuka and stunned everyone with his pace. At this place, you wouldn't rule out something similar happening tomorrow - anything can happen around here." Yusuke Hasegawa, Honda: "Thankfully the heavy showers we had yesterday stopped overnight, and we had drying, almost sunny, conditions throughout today. Both drivers did a good job today in qualifying, and Fernando succeeded to go through to Q3 while Stoffel secured P11 just missing out on Q3. As for Fernando, we detected hydraulic issue on his PU yesterday after the session, and we decided to change his PU overnight. It is disappointing thatžwe'll now start our home grand prix from the back of the grid due to the penalties incurred for the change. However, the set-up of both cars has gone well, and I am hopeful for a good performance tomorrow. Furthermore, Stoffel has a strong history around this track, winning last year in the Japanese Super Formula series, and I'm sure Fernando will show his usual determination and fight his way through the pack. We will do our best job tomorrow for all of our fantastic fans, and hopefully we can reward their support with a nice haul of points!" Carlos Sainz (15th, 1:30.413): "The results on the timesheet look worse than what it really is, because in Q2 we decided not to run any new tyres - we only went out on the ones used in Q1. The reason for this is that we want to have all the strategic options available to us for tomorrow as we'll be starting from the very back of the grid due to the grid penalty. So today's Q2 was a bit weird - we used it just to do some practice starts and ran on the used tyres... Not what we're used to doing! Therefore, it's a qualifying I didn't really enjoy, but it was a sacrifice thinking about tomorrow, when I'll appreciate it more than now. Hopefully we can have a good race and perform another good comeback using the new tyres still available from today!" Pierre Gasly (17th, 1:31.317): "How annoying, today's wasn't a good qualifying for me... I had quite a big moment during my best lap in Q1 and I locked the car in the first sector, almost going off track. Luckily I finished the lap, but it wasn't a clean one. I expected to improve quite a lot in my second run but in the end we didn't get this opportunity because of the session being red-flagged... So I'm disappointed about the final result because we had the potential to get into Q2. Hopefully tomorrow we can have a good race and I can manage the tyres well, extract the most out of the car and see where we end up!" Jody Egginton, Head of Vehicle Performance: "With dry running a bit limited on Friday, both engineering crews had limited data but very clear feedback from both drivers on what was required in terms of car balance. It's fair to say that a good direction was found for the set up and, as such, both drivers were happier with their cars by the end of FP3, covering their programmes containing both long and shorter runs, while using the soft and supersoft compounds. We headed into qualifying with a clear picture on balance requirements for the race and also qualifying itself but, with the 20 place penalty for Carlos due to a PU change, we decided to allocate less sets to qualifying in order to keep race strategy options open. That's why his final lap time was not representative of the ultimate pace of him or his STR12. With Pierre, the plan was for a more conventional qualifying but, unfortunately, with a snap in S1 on his first lap and the red flag on his second run, he was not able to bring it all together and also his lap time was not representative. We know there was potential for him to be much quicker, which is impressive given that he is driving in only his second GP weekend and has not been able to run a full dry programme here - together with his engineers he is still fine tuning his baseline set up. As you would expect, we are not happy with our grid positions but, importantly, we know there is a good opportunity tomorrow so, as always, tonight will be focused on formulating the strategy options ahead of the race in order to ensure we maximise any opportunities that may present themselves in the race. The target is still to score points in what is going to be a very tight mid field battle." Nico Hulkenberg (12th, 1:29.879): "We struggled in qualifying and the car balance just wasn't there, in particular with oversteer in the first sector. Generally, in qualifying you improve, but this time it wasn't coming to us, so a top ten position slipped through our fingers. It's not going to be easy tomorrow as the midfield is a competitive place to be. It wasn't the qualifying we hoped for, it's going to be hard work but we just need to do a good job to recover tomorrow. The package is good, and if we can have a good start everything is at play for the race; we can still score points." Jolyon Palmer (14th, 1:30.022): "Qualifying was okay, but the overall pace was a little disappointing for the team. The first run in Q2 went well and we were just out of the top ten, but on the second run, the car was sliding a bit and we couldn't improve. The track was getting better so when you don't improve, you fall down a long way. It's a shame but we have to start at the back of the grid. I think we have more pace than the guys in front, so it can be a fun race." Alan Permane, Sporting Director: "It's going to be a tough race day. Qualifying fell short of our expectations today. We struggled to get the car working as we would have liked in the first sector, however, we were relatively happy with the second and third sectors. It's going to be a tricky race, Jolyon will start towards the back of the grid with a twenty-place penalty and we will push hard and do everything we can to get in the points. The weather tomorrow looks warm and sunny so there shouldn't be anything unexpected there." Marcus Ericsson (19th, 1:31.597): "It was a decent qualifying for me. We made improvements from session to session, so we were able to come a bit closer to the competition. The end of Q1 was a bit disappointing - we were pushing on the last try when the session was interrupted by the red flag. Overall, I am pleased with my performance in qualifying today." Pascal Wehrlein (20th, 1:31.885): "Overall, I did not feel fully comfortable in the car today compared to yesterday. I am not satisfied with the balance of the car yet, and we are looking at the data to understand the causes. As for my qualifying - it is a shame about the red flag at the end of Q1. Obviously, I would have liked to complete my final try and improve my lap time. I am focusing on tomorrow now, and will give all I can during the race."